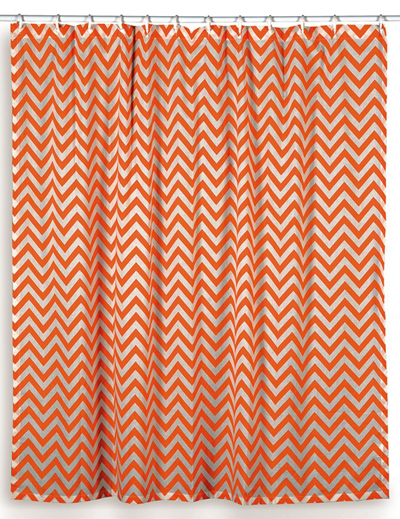 Add a vintage vibe to your bathroom with this Orange Chevron Shower Curtain crafted from easy-care cotton. $39. Free shipping. Buy here. 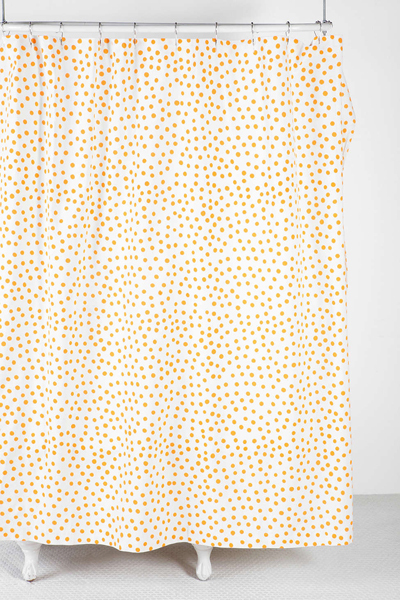 This woven cotton Orange Polka Dot Shower Curtain is topped with a playful polka dot print that cheers up any bathroom space. $39. Buy here. 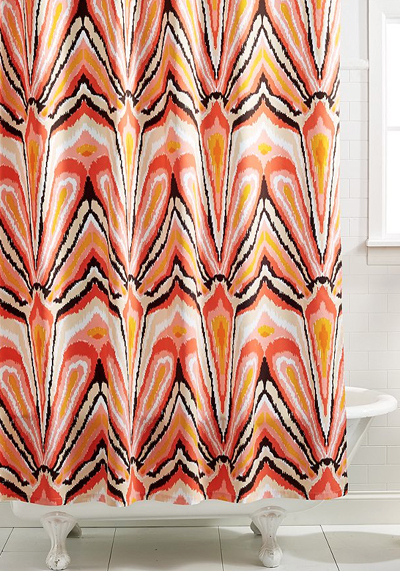 Awaken the look of your bath space with the Trina Turk Peacock Punch Shower curtain, featuring an energetic peacock print that exudes modern style. $59.99. Buy here. 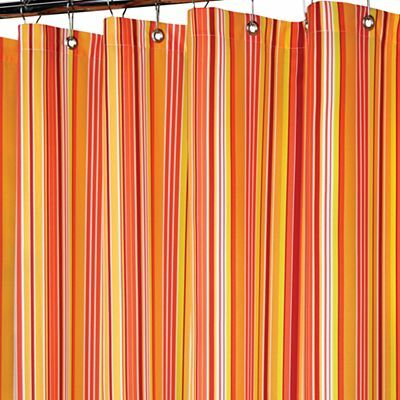 The Strings Stripe Fabric Shower Curtain features vertical stripes in adventurous colors that lend a fashionable flair to any bathroom. $28. Buy here. Bold hues deliver a luxe touch to the Jill Rosenwald Newport Gate Orange Shower Curtain. 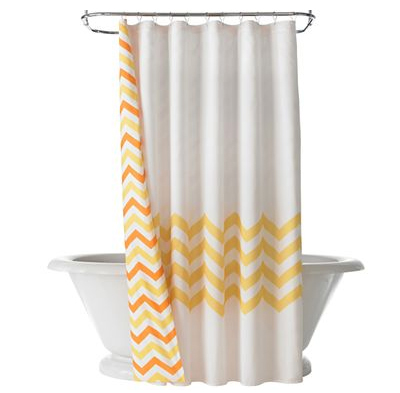 The bath accessory’s flamingo orange and white hues captivate in a geometric gate pattern. $40. Buy here. 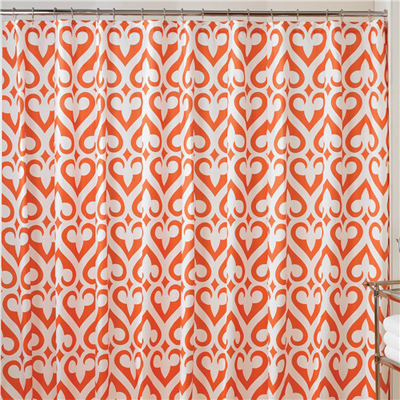 Add color and style to your bathroom with this quatrefoil-pattern Jay Fret Shower Curtain. A solid-color header adds contrast to the trendy yet classic pink and orange design. Printed on 100% polyester microfiber. $19.99. Buy here. 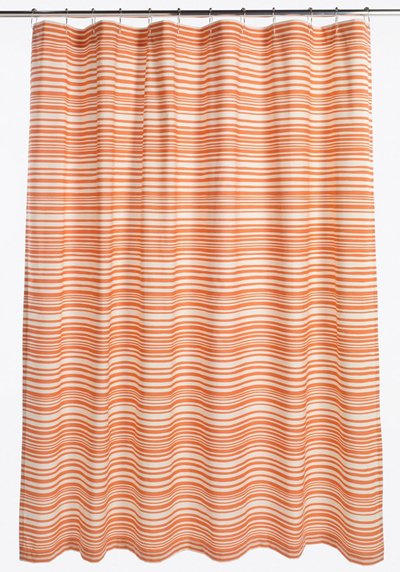 Update your bathroom with a pop of color courtesy of this Mixed Stripe Shower Curtain cast in easy-care cotton percale. $58 Sale $37.90. Free shipping. Buy here. Your bathroom’s look will be fun yet sophisticated when you add the Happy Chic by Jonathan Adler Lola Shower Curtain to its décor. Pair it with other Lola bath accessories for a look that’s bright and sunny. $35. Buy here.